To carry information and data from one place to another, we generally use USB drives due to their flexibility and ease of use. One of the biggest problems with USB drives is that they a pretty small and easy to lose or forget in public places like coffee shops. Though this is not a big deal, for the most part, it can have devastating effects if you are storing sensitive information. To deal with that, you can encrypt the entire drive so that no one can get access to the contents of the drive without proper authorization. To encrypt a USB drive we are going to use VeraCrypt. VeraCrypt is a free, open source, and cross-platform application to encrypt files, folders, and drives. 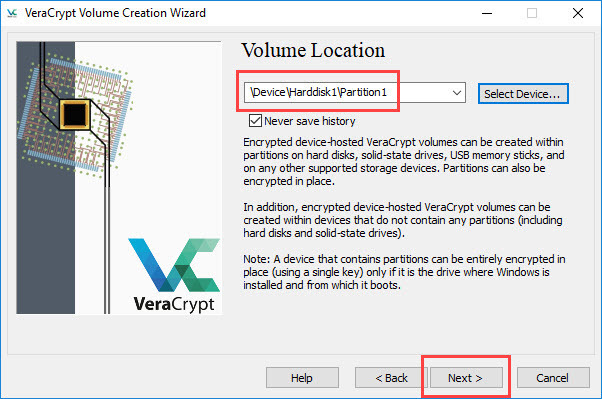 Using VeraCrypt you can encrypt system partitions, regular partitions or removable devices, create hidden encrypted containers and operating system, and create virtual encrypted disks. Besides from the that, VeraCrypt supports hardware-acceleration and real-time encryption. 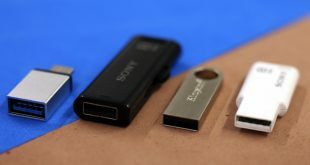 First, you need to insert the pen drive in your computer and format it with Veracrypt. This will erase everything you have on the drive, make sure that you have no data on your USB drive. Once you have encrypted your drive, you can add files and folders to it. And that’s it, you can now eject the flash drive, all the content in will stay encrypted. 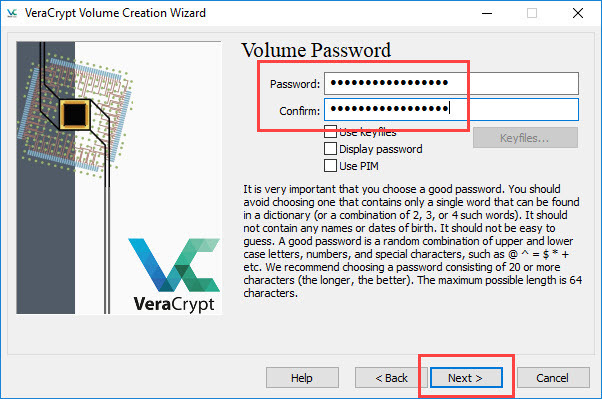 From now on, whenever you want to read the content of the flash drive on any computer, you need to first install Veracrypt on that computer and only then you’ll see the screen to enter the unlock password. 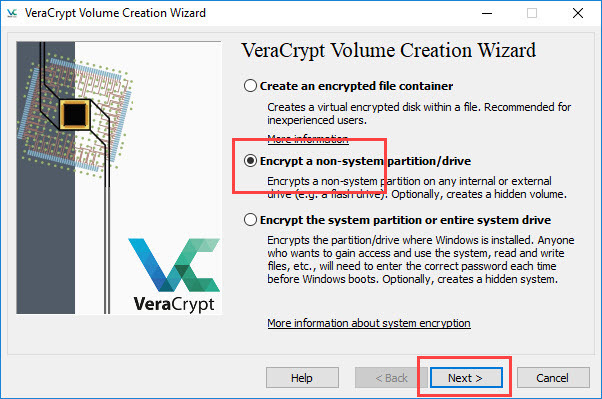 In this tutorial, I’m showing this in Windows 10, the procedure to encrypt USB drive using VeraCrypt is similar to other operating systems. There are several ways to password protect a folder, like – password protected zip file, Windows built-in encryption, or even buying an Encrypted Portable External Hard Drive. On the other hand, VeraCrypt is definitely not the most user-friendly way of encrypting a USB drive. So, the question has to be asked, why should use VeraCrypt? Since it’s a dedicated encryption software, it comes with advanced features like creating an encrypted drive inside an encrypted drive. Useful in the situation, when someone points a gun at you and ask you to unlock the drive. To get started, head over to the official website and download VeraCrypt for your operating system. Once downloaded, install it. 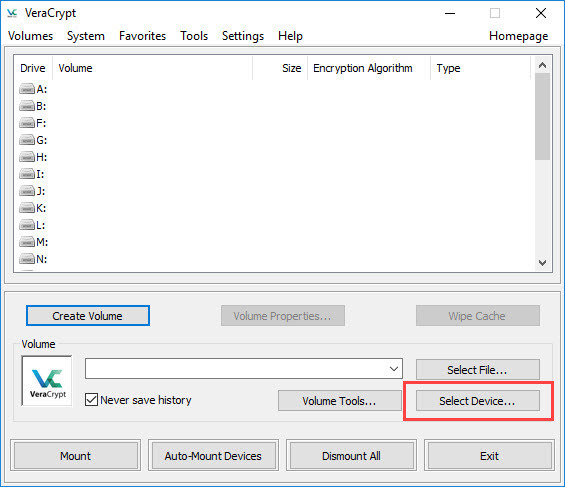 While installing, VeraCrypt will prompt whether you would like to install it regularly or in portable mode. 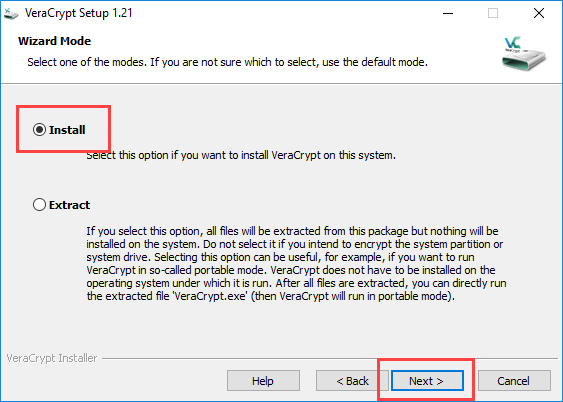 Unless you are trying to carry VeraCrypt with you on some other USB drive, Choose “Install” option and click the “Next” button. Once VeraCrypt has been successfully installed, it will let you know the same. Click on the “Ok” button to complete the installation procedure. 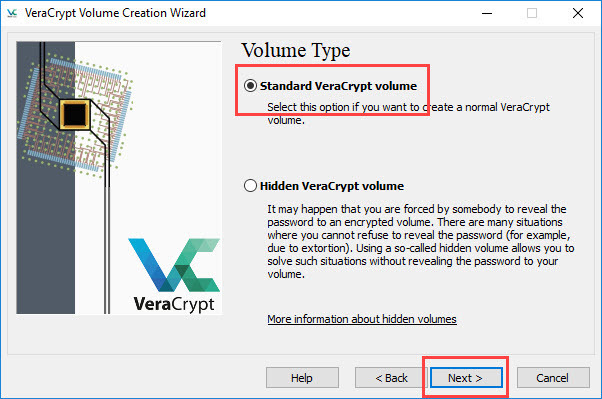 Here, select the radio button “Standard VeraCrypt volume” and click on the “Next” button. 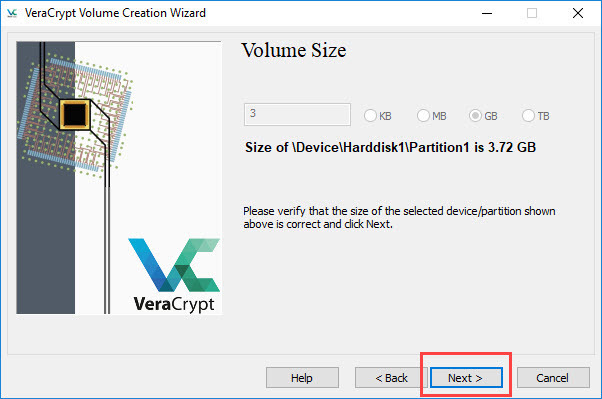 VeraCrypt will show all your attached storage devices and their partitions. 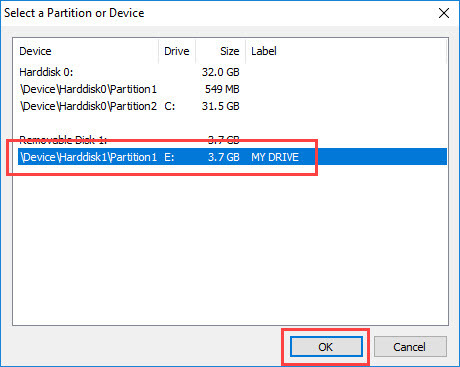 To encrypt the USB drive, find it in the list and select the partition of the USB drive. Typically, you can see the drive letter and name next to the USB drive partition. In the main window, click on the “Next” button to continue. Here, select the first option “Create encrypted volume and format it.” If you already have data on the USB drive then you have to select the second option “Encrypt partition in place.” However, depending on your USB drive size and the data in it, it can take quite a bit of time to encrypt data in place. So, preferably choose the first option as it is much faster. After all, you can always move the files after creating the encrypted container. 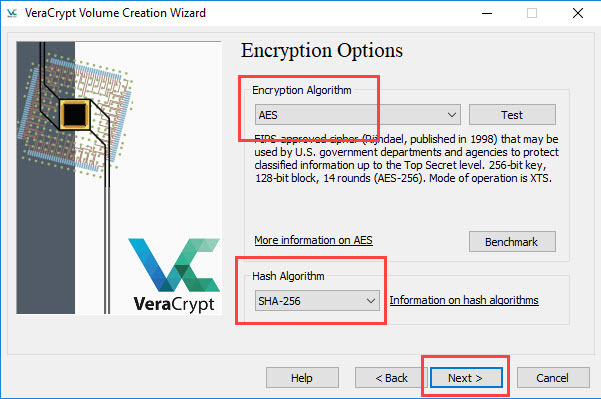 VeraCrypt supports multiple types of encryptions and hash algorithms. You can choose the ones you like from the drop-down menus. If you don’t know what to choose, select AES for Encryption algorithm and SHA-256 for the Hash algorithm, they are pretty strong. Click on the “Next” button to continue. Since we are encrypting complete USB drive, you can not change the container size. Click “Next” to continue. Enter a strong password and click “Next” to continue. This is the password you’ll have to use to unlock your pen drive, next time you want to use it. 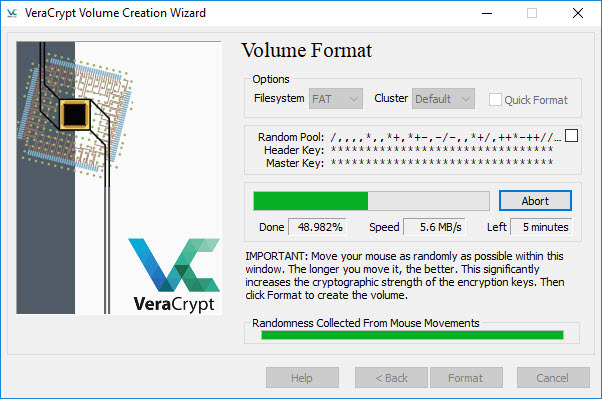 Now, VeraCrypt tries to create a good random pool to strengthen the cryptographic keys using your mouse movements. So, move your mouse randomly on your screen until the progress bar appearing at the bottom of the window turns green. Once done, click “Format” button to continue. You will see a warning window, just click on the button “Yes” to continue. 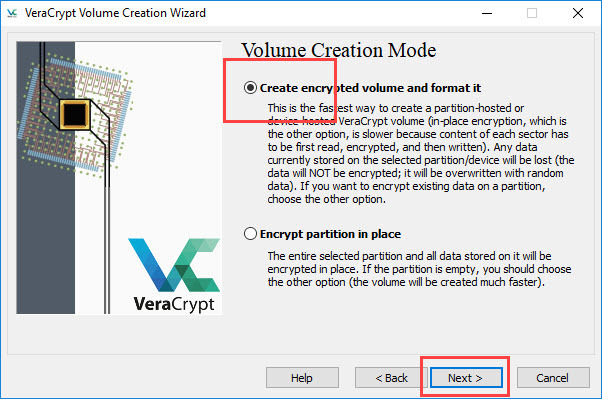 As soon as you click on the button, VeraCrypt will format the USB drive and starts creating the encrypted container. Depending on the drive size and its speed, it can take some time. So, sit back and relax or better go get yourself a coffee. Once VeraCrypt is done encrypting the USB drive, it will let you know. That’s it. You’ve successfully encrypted the USB drive. If you open the file explorer, you will see your drive but you cannot open it. 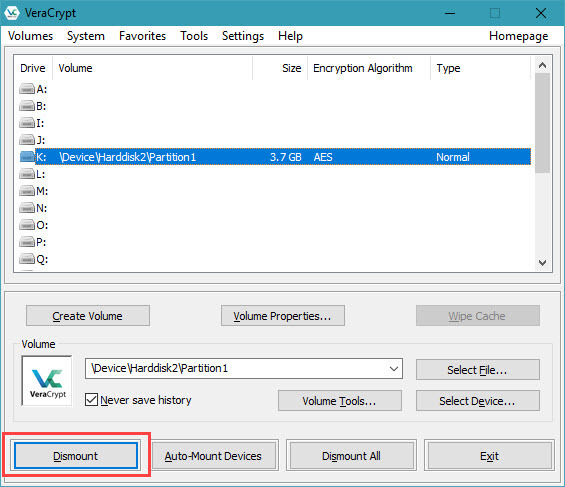 You need to use VeraCrypt to access data on the drive. Note: Windows might think the drive is damaged and may prompt to format the drive. Simply ignore the warning. Do not format the drive. 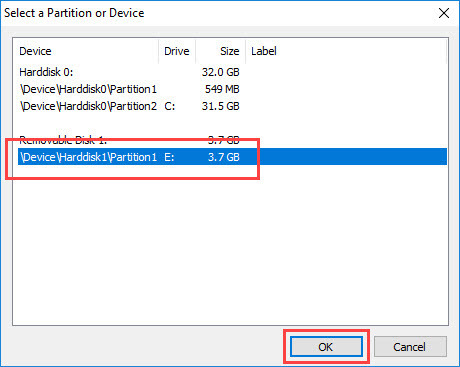 Select the encrypted partition and click the “Ok” button. In the main window, select a drive letter from the list and click on the “Mount” button. Again, depending on the encryption algorithm, drive size and amount of data in it, it may take some time to decrypt the drive. In some occasions, VeraCrypt may seem frozen and unresponsive. Ignore it. The application is busy decrypting your drive. After decrypting, you can see your USB drive mounted using the drive letter you chose in the above step. From here, you can add, remove, or modify files as you wish. Once you are done, select the drive from the list and click on the “Dismount” button. This will finish any last minute encryption and safely unmounts the drive. That’s all there is to do and it is that simple to encrypt USB drive. Comment below sharing your thoughts and experiences about using the VeraCrypt to encrypt USB drive. Now that you have encrypted your USB drive with VeraCrytp and added files to it. The next thing you want to do is send the USB drive to your friend or maybe use it on some other computer. Most people would assume that you just have to plug-in the flash drive and you’ll see a pop-up asking for a password. Right? Well, it doesn’t work that way. In order to open a USB file encrypted with Veracrypt, you need to install Veracypt app on that computer as well. For instance, if you have encrypted a USB drive with VeraCypt on Windows, and want to read it on macOS, then you need two things. 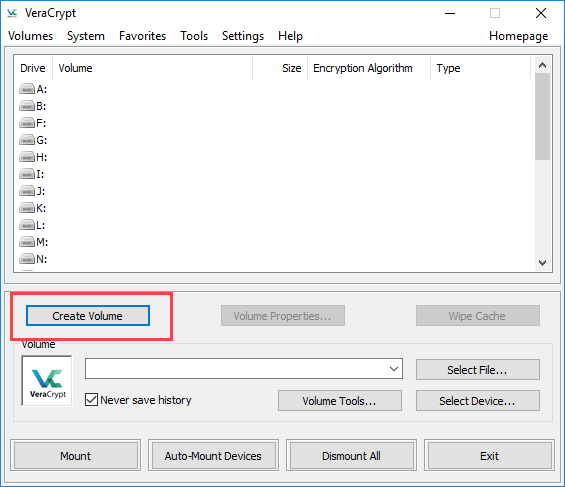 One, install VeraCrypt for macOS, and second a software to mount NTFS file of windows like NTFS-3G or FUSE etc. To better understand the an compatibility issues of USB drives with the different file system, check out this video. Previous What is Xmonad? Why You Should Use it?